Equipment Hauling Olympia | Forklift & Boom Lift Hauling Thurston Co.
Olympia heavy hauling company, Nisqually Automotive & Towing provides heavy equipment hauling, container hauling and machinery hauling services in Olympia, Lacey, greater Thurston County and throughout SW Washington. 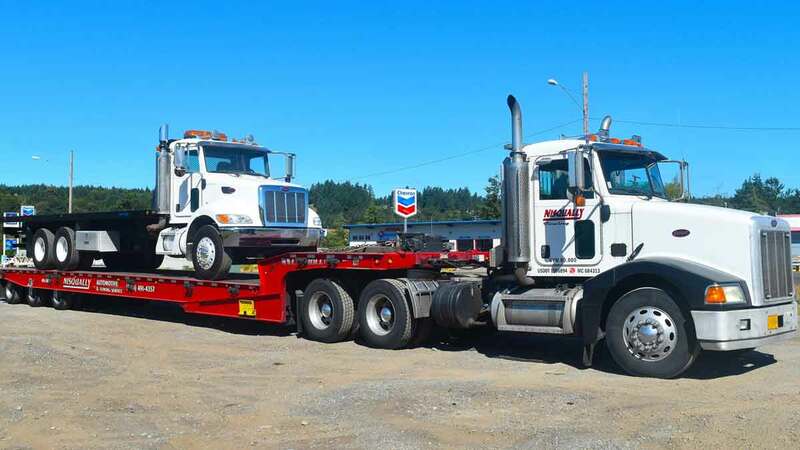 Thanks to our extensive fleet of flatbeds, landolls and industrial carriers, we are the “go to” hauling company for many companies in the PNW. Our heavy hauling rollback allows us to carry loads up to 38,000 lbs. 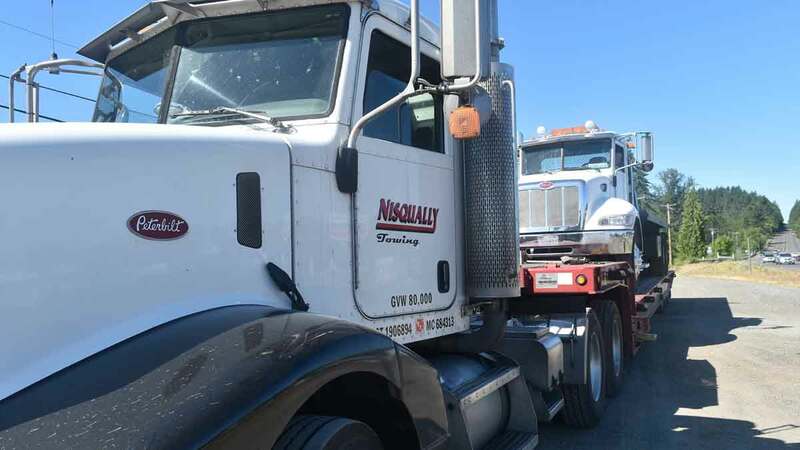 We offer scheduled and immediate hauling of all heavy cargo including heavy equipment hauling, construction hauling, rental equipment hauling and heavy load hauling. Contact our 24hr dispatch center now at 360-491-HELP (360-491-4357) to get the Nisqually Heavy Hauling Team working for you. Our affordable and efficient heavy equipment hauling services provide a virtual transportation department for many clients, saving them time and money. We can provide emergency or scheduled equipment hauling anytime – 24/7/365. Contact our 24hr Heavy Hauling Team now at 360-491-HELP (360-491-4357) to get the Nisqually crew working for you. 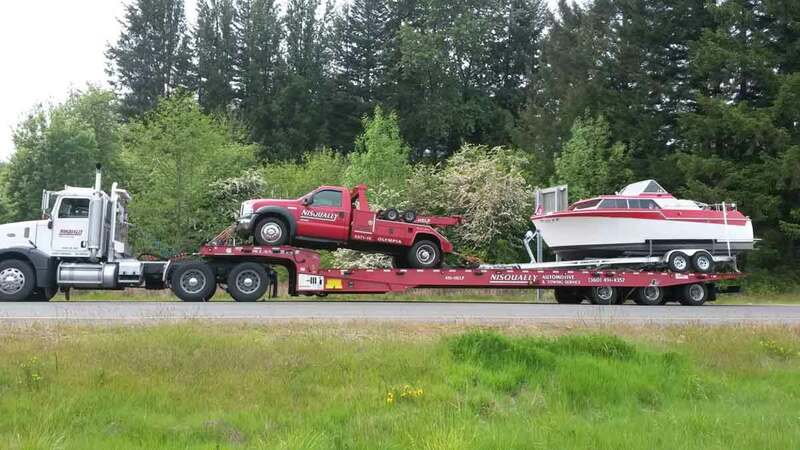 Nisqually Automotive & Towing provides expert and professional boat hauling services throughout Olympia and the South Sound. Whether you find yourself on one of Puget Sound’s many inlets or one of the several nearby lakes and state parks, the Nisqually Hauling Team can safely transport your boat wherever you are headed. Our certified and experienced team will handle your boat with care. Call our Boat Hauling Team at 360-491-HELP (360-491-4357) for immediate or scheduled Olympia boat hauling services.